This economical ammo from Prvi Partizan, features a Jacketed Hollow Point round, which is recommended for use in self-defense weapons. The JHP round is designed to expand rapidly after hitting its target, causing a much larger wound channel, without completely penetrating. 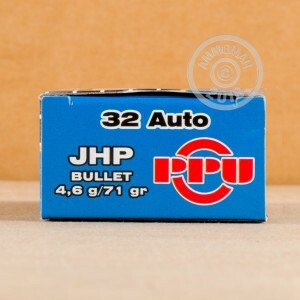 These two things combine to give JHP ammo unmatched stopping power. 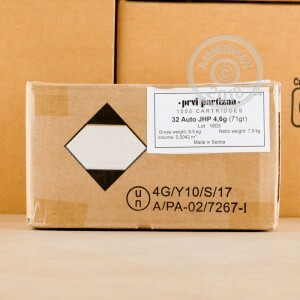 32 ACP Prvi Partizan ammo has a great price, making it perfect if you want to practice with your carry ammo. These rounds are new production, non-corrosive, and have re-loadable brass cases. Prvi Partizan has been making quality ammunition since 1928. Their ammunition factory is located in the southwestern part of Serbia, in the town of Uzice. Prvi Partizan has supplied Serbian Army and Police and many foreign Armies. They also produce hunting and sporting ammunition sold all over the world. 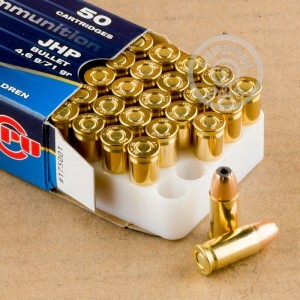 This ammo has gained popularity with American gun owners since it was introduced to U.S. markets.